I am the daughter of Dr. and Mrs. Hunter Sweaney and want to clear up one small matter, especially since you used the word "reportedly." Below are the facts for you to use as you wish. But before I get to it, you do such a great job -- truly amazing. Glad you know Cissy and Cookie -- they have good recall about so many facets of Durham. I do if prompted, but they have great recall from scratch. I went with them to hear your excellent talk last year at the Carolina Theater. Cookie and I are lifelong friends. And this is a great photo of the house -- better than any I have. Any chance you could send it to me in one form or another? Know you are busy . . . to say the least. The property was given to Frances (note spelling) Foushee Sweaney by her mother, Annie Foushee (Ann Leak Wall Foushee) who was the widow of Howard Alexander Foushee. Annie had inherited the lot, along with all of his estate, from her unmarried brother-in-law William Linwood Foushee after his death in 1949. Annie's husband died an early death from pernicious anemia in 1916. So it is more correct to say something like "Dr. Sweaney married Frances Leak Foushee, whose parents built the house at 809 Proctor Street. The property was given to them by Frances's mother." I.e., it was Annie who gave it, and not both parents. Interesting...RE: "Annie's husband died an early death from pernicious anemia in 1916." I had never heard of pernicious anemia regarding anyone other than James B. Duke; he died in 1924 of pernicious anemia. A quick search indicates Alexander Graham Bell died of it in 1922. Annie Oakley in 1926, and Admiral Robert Peary in 1920. Apparently a cure (treatment?) was right around the corner. That's a tight time frame...no other "significants" noted. Probably coincidental...one of thousands of untreatable disorders, diseases and conditions that filled ancient graves. Not really relevant, probably not even appropriate for the site, but an interesting (to me) observation. 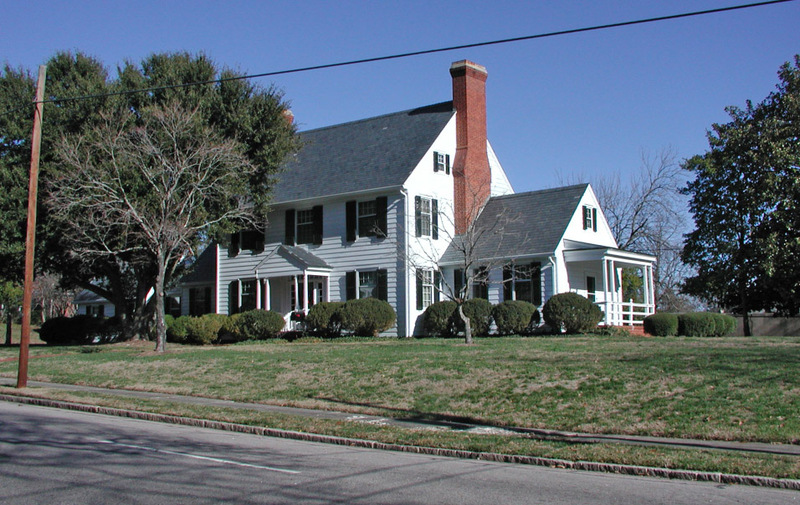 Near replica of the St. George Tucker House in Williamsburg, Va., built in 1952 according to design by Archie Davis for medical doctor Hunter Sweaney. Interior in center hall plan features modillion crown molding, Georgian mantelpieces, sheathed wainscoting, and a study fully panelled in 16" beaded boards. Dr. Sweaney married Francis Foushee, whose parents built the house at 809 Proctor St. and reportedly deeded them this property.